What makes America great? The Constitution, the Grand Canyon, and the Statue of Liberty would probably make most peoples’ short lists. I’d also nominate chili cheeseburgers, the fact that we occasionally elect lunatics to high office just to keep the rest of the world from relaxing too much, and, of course, roadside dinosaurs. Now, I know that there are dinosaur parks in other countries. Hell, dinosaur parks were invented in other countries. But I ask you: can you name another nation on earth wherein a bloody civil war that sunk the entire country into decades of social and political unrest is celebrated by imagining that it had been fought against freakin’ dinosaurs? (If you have no idea what I’m talking about, click here for more awesome that you are probably prepared for.) I submit that you cannot. No dinosaurs manning the guillotines in Paris, or the machine guns in St. Petersburg. I thought that W.J.T. Mitchell’s The Last Dinosaur Book was pretty darned loopy, but the chapter on how Americans celebrate being American by putting up gigantic dinosaurs all over the place struck a sympathetic chord in my heart. 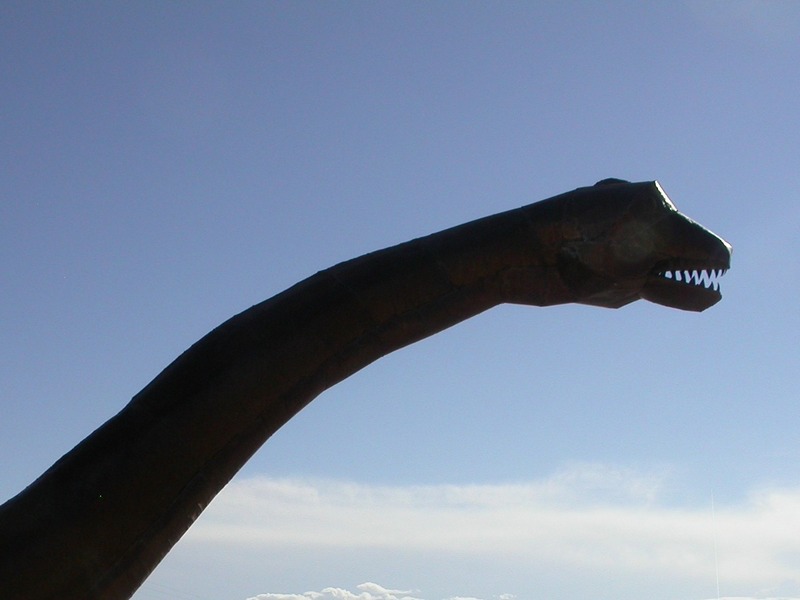 Because whatever you may want to believe to the contrary, we do put up gigantic dinosaurs all over the place. 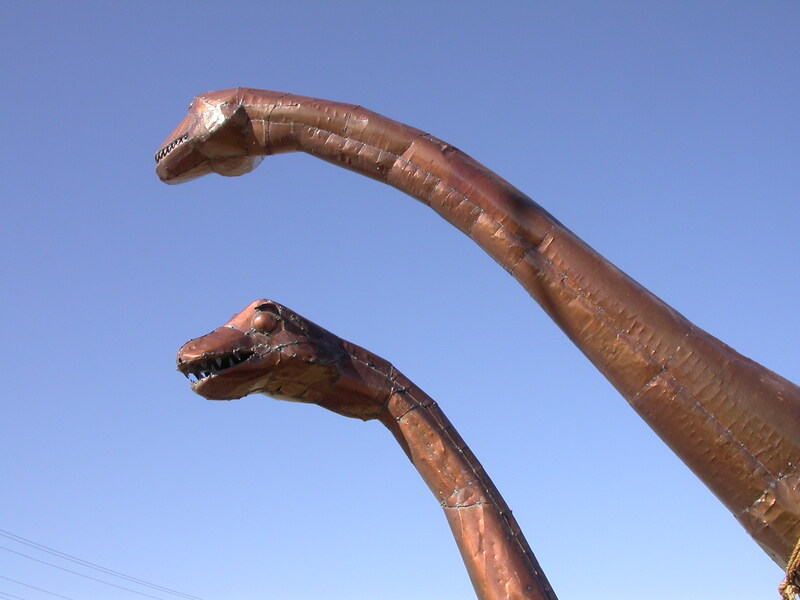 And if you’ve spent much time on the fabled open roads of this great land–which occupy even greater mythological space than our beloved saurians–you’ve seen ’em. 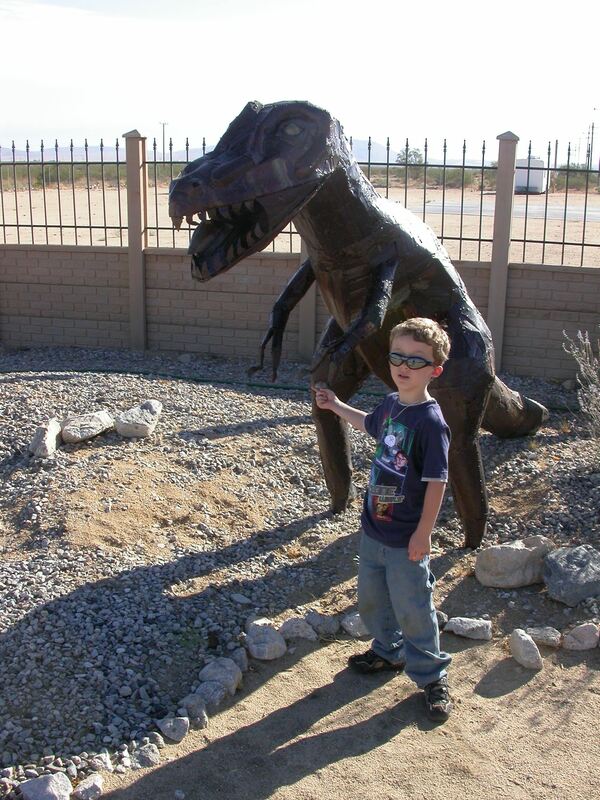 Case in point: the dinosaurs of Yucca Valley, California. These were a surprise to me when I discovered them this past weekend. I was on the road to Joshua Tree for a star party, and you can head on over to 10 Minute Astronomy for that end of this two-part inter-blog cross-country tale of national champion harmonica players, florescent arthropods, and welded scrap metal. Here in Part Dos I am only dealing with the saurischians. And, oddly enough, they were all saurischians: a T. rex, two spinosaurs, and a mother and baby sauropod. All arrayed around the fence enclosing some kind of real estate office, right along California Highway 62 at the east end of the town of Yucca Valley. No signs with the dinosaurs, and no explanation of the connection, if any, between them and the business. Although the attraction is not that hard to fathom. 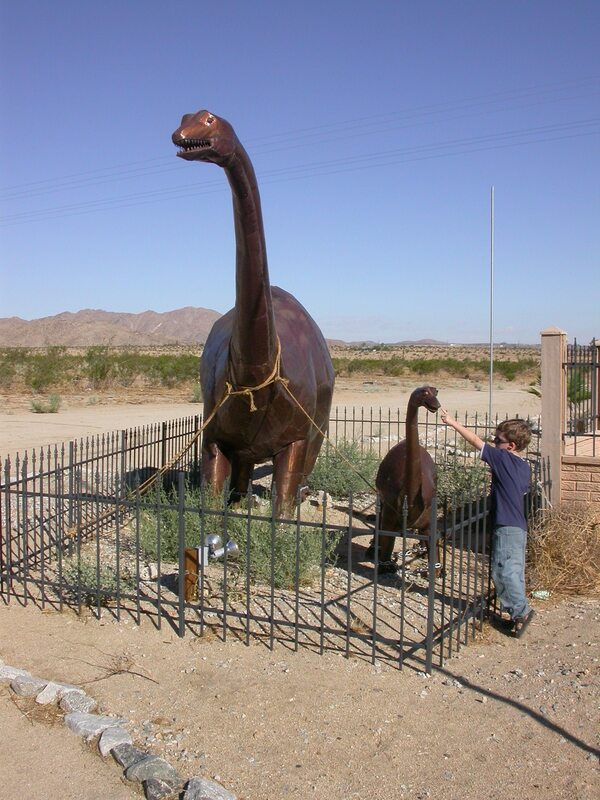 Also, I was happy to see that whereas the three stinkin’ theropods are unfenced and unchained, the sauropods are protected behind a spiky fence, and held down with both ropes and chains. Which, I admit, seems a bit excessive. 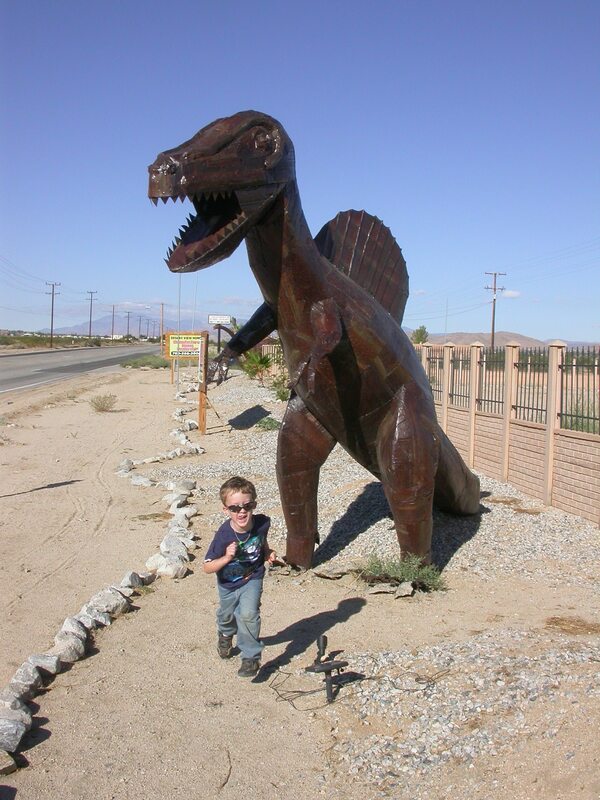 But it also apparently means that potential giant-welded-dino thieves in the greater Yucca Valley area prefer sauropods, which I take as a sign of natural discernment and good taste in the population at large. What does all of this mean? In part, it means I should probably revisit my policy on not blogging after midnight. 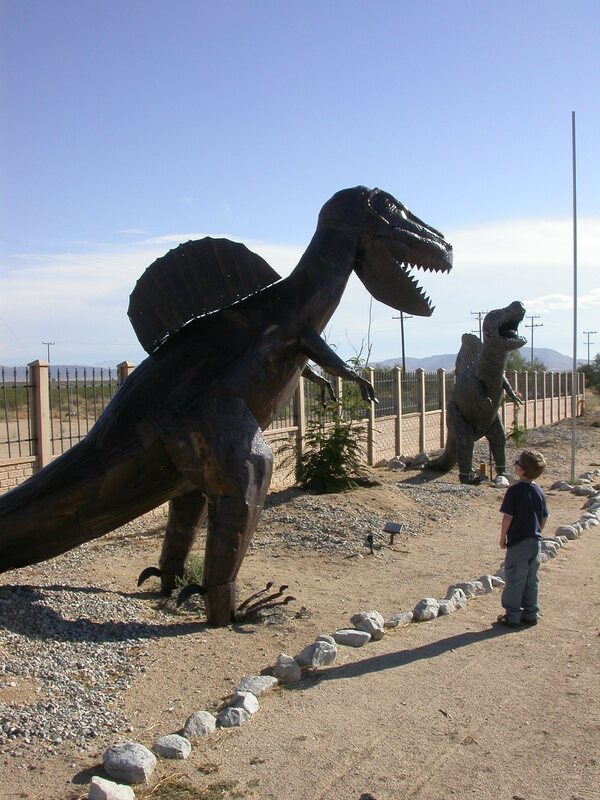 But also, a local guy armed only with welding equipment and a pile of scrap metal decided that the best way to promote his business was by putting up some roadside dinosaurs. He could have built a State of Liberty or a St. Louis Arch or a moon rocket. But nobody would have stopped for those. 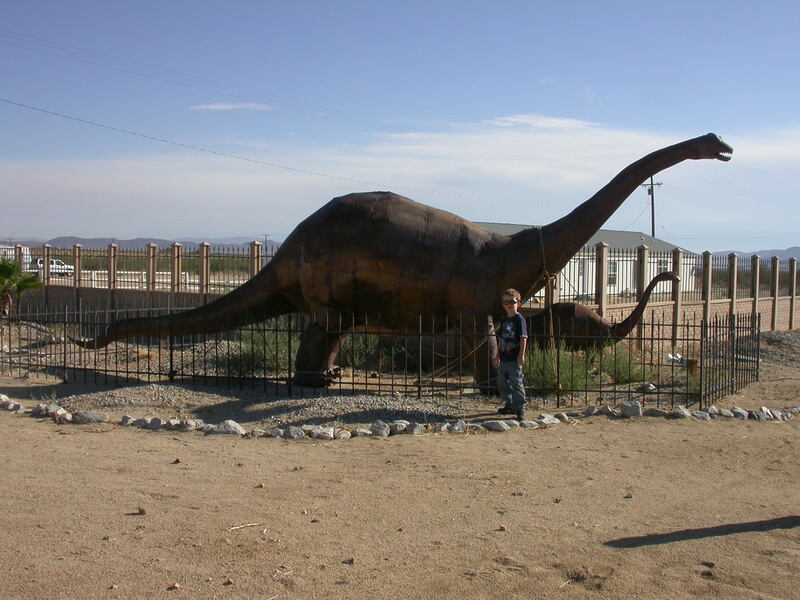 People stop for roadside dinosaurs. One more, for the road, as it were: an homage to Jerry Harris. Waitaminute…does that mean the dinosaurs were in favour of slavery? Actually, yes. That many people artificially confined in one spot is the equivalent of a buffet when you’re a large theropod, so they’d enthusiastically support it.